Recently I won HeNe laser tube on EBay, and seller from Germany surprisingly sent me 2 lasers instead of 1 :-) One is slightly newer (~2000), I even managed to find datasheet on manufacturer's website, another is older. Also I bought HV power supply - 2100-2900V, 6.5mA and 8000V during ignition. But the main issue for me was high-voltage ballast resistor - it is needed due to "negative resistance" of gas dischange, constant current power supply might not react fast enough. 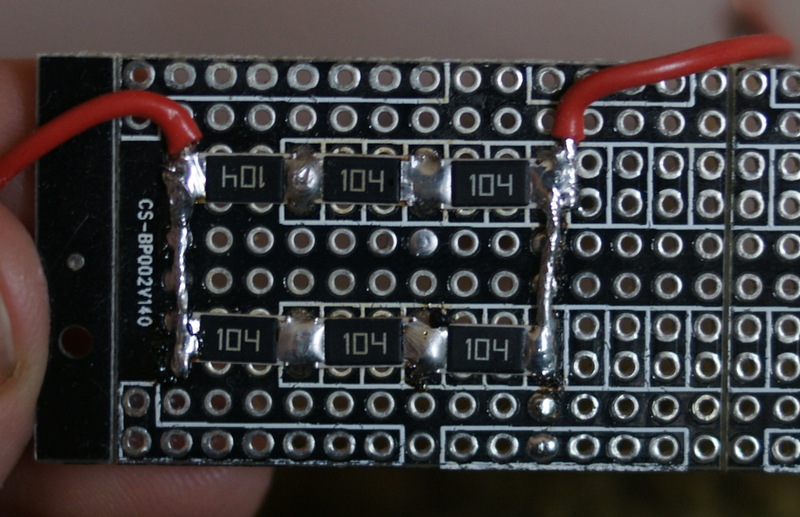 I had no any HV resistors, so decided to try 2512-SMD parts: they are rated for 500V voltage and 1W heat dissipation - so I will have to use them quite out of spec. Voltage drop across 200 kOhm resistor for 3mA current is about 600V, so it did not brake down even for mere 2 resistors in series, but heat dissipation was so high (~1.8W on small board without radiator) that resistors were floating in molten solder. Obviously, It was impossible to add radiator on my protoboard I increased number of resistors to 6 and reduced total resistance down to 150 kOhm - this allowed for prolonged laser operation without resistor overheating. Now I see that i probably used too high ballast resistor value - even 75kOhm would work just fine according to datasheet. FYI documentation also suggest to place ballast resistor as close as possible to anode of the laser for stable operation. 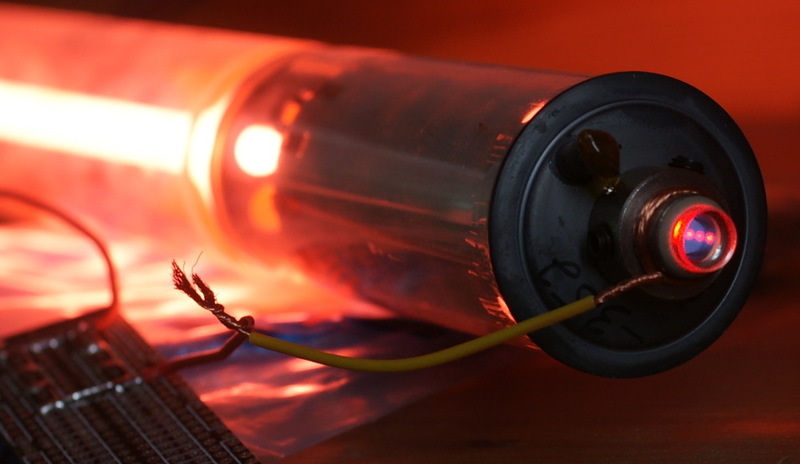 I believe ballast resistors for CO2 lasers could be done the same way - but number of resistors must be like 10-30 times higher, and obviously on a single-sided board. One should remember that maximum heat dissipation for 2512 resistors is around 1W and temperature of whole ballast board should be monitored. Laser spots - are perfectly round. From left to right: first tube, second tube and parasitic ray from 100% reflecting mirror on the back of second laser. As it appears, sides of this mirror are deliberately not parallel.